A mantra (manan, tra: Liberation by thinking, Sanskrit: center of thought) is a syllable or a sequence of syllables. In the Vedas long verses are sung as mantra-samhitas. 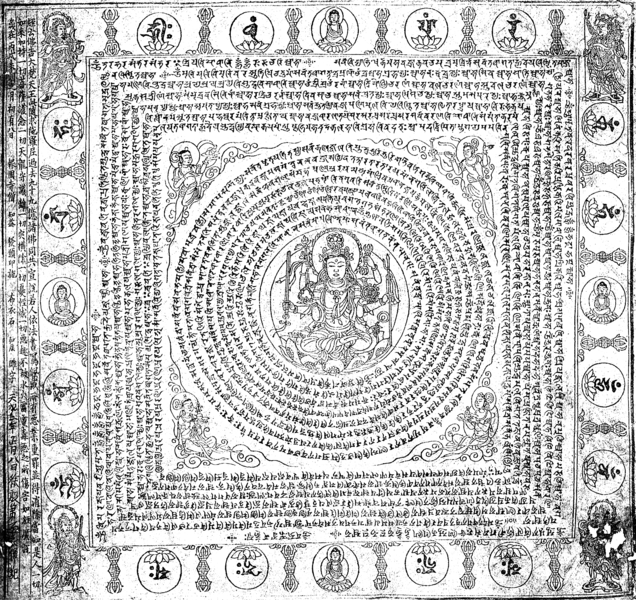 A collection of Mantras is the Mantra Mahodadhih ( mantra-uda-dhí, Mantramahodadhi; big ocean of Mantras ) of Mahidhara from the 16th century with ca. 3300 Verses in 25 Tarangas(published now by Ram Kumar Rai. ) . The Brihat Tantrasara('Big essence of Tantra') contains many mantras of godesses. Often mantras are also repeated halfloud together with a mala, which strengthens the physical effect. The corresponding exercise is described in Hinduism as Japa (Nama Smarana). The monosyllable mantras are also referred to as bija mantras (OM, HRIM, KRIM, HUM, SHRIM) . They are explained in the Mantra Shastra. The Upanishads are another source of mantras. However, the letter combinations are not arbitrary.. Krishna says, for example, in the Bhagavad Gita that he is the 'rk'. The 'ee' refers to the pure aethers of the Mayamaya. U refers to material ethers, etc.. The creation of mantras is subject to secrecy. When a mantra has the name of the godhead and no monosyllable bijas of the godhead, it is called a nama mantra. 'Nama - mantras' can result in correspondingly high meditation forces from the area of Trimurti. There are different types of meditation, such as japa yoga and nada-yoga and also loud repetition (possibly with a rosary mala), as (for example only) the jaap of the Guru Bija Mantra Om jhram jhreem jroum saw gurave namah. Well known mantras are Aum or OM ('kara'), AIM , Ong namo, and Om Mani Peme Hung ( Om Ma tri Mu Ye Sa Le Du ) and Om Namaha Shivaya. There are many tantric and Buddhist mantras from ritual-texts in circulation as well as mantras from the Mantra Sastra and Nama  mantras from Shiva, Vishnu and Krishna and many others. The majority of the tantric mantras is longer as in Ka Ye E La Hrim Ha Sa Ka La Hrim Sa Ka La Hrim Shrim (Shodashakshari Mantra) or Om hreem streem hoom Phat (Ugra Tara). These vibrations are however not meant to compensate for a materialistic lifestyle, and misuse can produce bad Karma and Dharma. For beginners, they usually have little effect. Dharanis exist in Hinduism as well as in various Buddhist schools. A Dhāraṇī (tib. Gzungs) is a text with magical meaning, which is the essence of a prayer or of an esoteric doctrine. Such texts can reach a considerable length. Buddhist examples are the Cundi Dharani  (Mantra : namaḥ saptānāṃ samyaksaṃbuddha koṭīnāṃ tadyathā oṃ cale cule cunde svāhā) and the Usnisa Vijaya Dharani - Sutra . Multisyllabic mantras are found in Tantra where they are used for invocation and meditation on deities and yidams, also in the context of rituals. In the Quabbala, the universal properties of letters are applied. In the Sepher Jetzira rabbis have tried to systematize this kabbalistic knowledge. This secret knowledge has also been used, in particular, in medieval spiritual alchemy and in original Rosicrucianism. In the Fama Fraternitatis, the C.R. Formula and others are used. in the Asian region the tantric Kaula, the japanese Shingon and the Longchen Nyingtik used single letters in Sadhana. In the last century Franz Bardon has tried to systematize this knowledge in his Quabbala - book, using multi-concentration and color visualization, but with little reference to beginners. Mantramahodadhi with the Commentary Nauka, Sri Satguru Publications, Indian Books Centre, Delhi (1984, 1985), ISBN 978-81-7030-050-2.